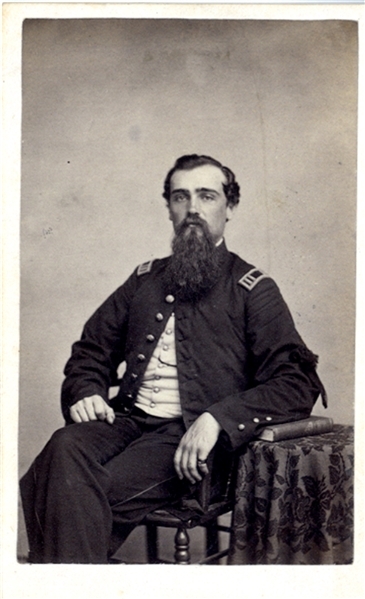 Carte de visite of J. LeRoy Bell, 11th New Hampshire, who helped raise Company G of that unit and would serve as it’s second lieutenant, later rising to the rank of captain. Captain Bell was wounded in action on four occassions while fighting in Virginia during a five month period in 1864. In May he was wounded in the left leg at Spotsylvania, in June by a musket ball that struck his scalp near Poplar Springs Church, another head wound at he Crater along the front lines in Petersburg during the month of July and again a severe wound to the right thigh at Pergram’s Farm in September. This CDV has Kimball and Son backmark and is in fine condition.